For me, real virgin territory would be that place I had never visited before–in books. While maps, museums, art, theater and films all aid me in imagining that spot I am heading for, nothing brings me there like the written word. So, as I prepare once more to go to Paris, where over decades I have visited, lived, studied and written, I return to beloved tomes—my personal primer—to remember where I’ve been, and new ones to help me find where I am going. It is easy for me, as a lapsed medievalist, to still see the Paris of Heloise and Abelard in the twisting streets of the Latin Quarter where he was her tutor. Or to sympathize with Eleanor of Aquitaine, the fifteen-year-old bride of the hapless Louis VII, who, missing her sunny Provence, complained of the primitive, smelly court at the Cité Palace and the dreadful cold of Paris. I have learned French manners from the acid wit of Moliere and Voltaire, and of revolutionary times from the wise letters of Mme. de Stael and the historical prose of Victor Hugo. For me, poetry was reinvented with the great Symbolists—Baudelaire, Rimbaud, Verlaine, Mallarme—who haunted the bohemian districts of Paris in the late 19th century. The 20th century brought the Seine that runs eternally under Le Pont Mirabeau, as Apollinaire described in his poem of the same name, and a city eternally divided by the Left (Bourgeois) and Right (Aristocratic) Banks as Proust defined them. As for the ‘20s and ‘30s, it’s hard to walk anywhere without running into the ghosts, and words, of the writers–James Joyce, Gertrude Stein, F.Scott Fitzgerald, Anais Nin, Henry Miller—to name a few, who have created modern Paris in my mind. Hemingway seems to have left his mark in every second bar in town, and the Left Bank streets I love are haunted by the post-war existentialists. I’m pretty sure I even had coffee once with Simone de Beauvoir at Deux-Magots. This incomplete list reveals only some of the literature so important to my understanding of Paris and its eternal transformations. 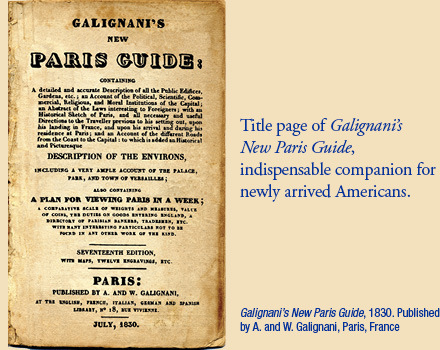 While it spans centuries, I have another collection of books–travel guides–that span the decades of my own experience. They, too, are dog-eared and highlight a Paris,and a personal past, that is transformed. The teen-age student who first arrived there is now a grandmother, and the days of living well on $5 seem a distant dream. Sites I once loved, such as the Jeu de Paume Museum, which housed many Impressionist masterpieces, and Les Halles, the vast central market with its all-night delivery of fresh produce and hot onion soup, are no more. Meanwhile, new structures have risen: the Pompidou Center, the opera house at the Bastille, the huge complex of La Défense. So as I get out my passport to revisit the City of Light and share its wonders with the Wanderland Writers Workshop, I’ll look over the old maps, books and guides again. But much as I love those dog-eared pages, and memories, I also know that to fully experience Paris is to carry its past, and mine, into the present. I’m looking for new works, new corners of the city, new encounters to write my next chapter. The most important book I’m bringing is one of blank pages.